This may not apply to 500 MHz to 700 MHz iMacs that use the PowerPC 750CXe CPU, as they use a revised logic board. The original author is not known to us. This infomation does not confirm stable operation. 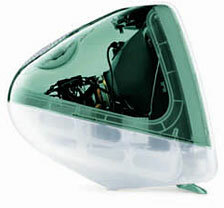 Please note that any modifications you make to your iMac are made at your own risk. I analyzed how to increase the clock speed of an iMac DV. If you adjust the set of resistors labeled “R35” to “R42” on the logic board, you may configure the processor clock PLL. First, remove the display connector cover. Remove iMac bottom cover (6 screws). Remove iMac bottom shield (6 screws). Nonfigure the set of resistors labeled “R35” to “R42” on the logic board.